The day started with the introduction of the theme, Envisioning Digital India. Professor Dr. Ravi Kumar initiated the convention with the introduction of Entrepreneurship and Women in Digital India. 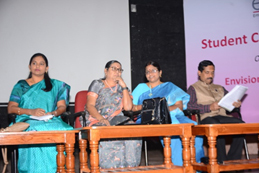 Dr T. V. Geetha, Dean Anna University, first ever woman dean of the University, chief guest of the function spoke about the transformation initiatives of Anna University and how women should continue to pursue their dreams to make it big.Ms. Eva James, Vice President, Renault Nissan Technology was the guest of honour. She gave an inspiring talk motivating the students. She focused on the challenges they would come across in their lives and how they should learn to manage them effectively and efficiently and make the best of both worlds. She gave examples from her day to day life that engaged the audience. 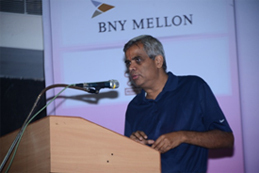 Mr.Srinivasan Sundararajan continued the morning session with his interesting presentation on Augmenting Humanity- An introduction to Robotic Process Automation and Artificial Intelligence. The morning session concluded with a panel discussion on 21st Century skills every student needs for survival and excellence. 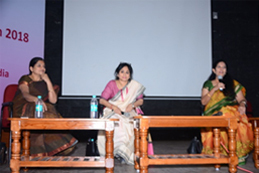 Panelists were Ms. Kalyani Narayanan, Ms Uma Benjamin and Ms. Bhanurekha Condur. The afternoon session of the convention saw presentations from three students who were mentored for success. This was followed by the screening of award winning short films on the theme – Digital DNA of India and prize distribution. Next followed the distribution of prizes to winners of Mobile App Contest. The convention came to a conclusion with ‘STRI - a tribute to women’, a music program by BNY Mellon Technology. Dr. Vidya Durai, Head of eWIT Academic Initiative was instrumental in curating the program and successfully conducting it with the support from other eWIT Governing Council members.